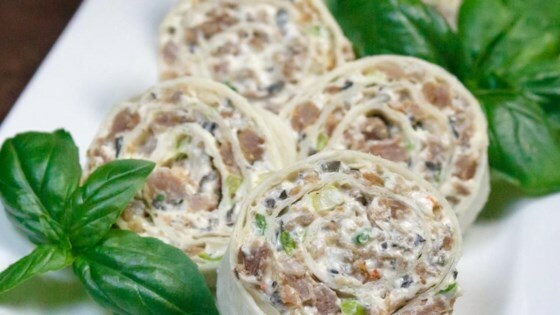 "Tortilla pinwheels is an easy and delightfully different appetizer. It can be changed according to tastes and ingredients on hand." I've been making this for a few years now, except instead I use ham, tortillas, cream cheese & salsa. They are a hit whenever I make them. Very quick and easy to prepare. Used Alouette brand herbed cream cheese and think this added something. Also try turkey breast with herbed cheese and cranberry sauce (mixed together). Took a tray of these to a Christmas party and came home with an empty tray. Very tasty and easy. I used green olives with pimentos. The green and red gave them a pretty holiday look.